STOCKHOLM, Oct. 7 -- Three scientists share 2015 Nobel Prize in Chemistry, the Royal Swedish Academy of Sciences announced Wednesday. The Nobel Prize in Chemistry 2015 was awarded to Tomas Lindahl, Paul Modrich and Aziz Sancar "for mechanistic studies of DNA repair," ie. for having mapped, at a molecular level, how cells repair damaged DNA and safeguard the genetic information. "Their work has provided fundamental knowledge of how a living cell functions and is, for instance, used for the development of new cancer treatments," the statement said. In a telephone interview after the announcement, Lindahl said he was "surprised" and "proud to be selected" for the prize this year. Recalling why choosing this field of research, Lindahl said it is "important to have DNA repair, as damages in cells are unavoidable." "As we understand the mechanism better," it provides "better hope" for cancer treatments, said Lindahl, talking on potential applications of his discovery. Each day, DNA is damaged by UV radiation, free radicals and other carcinogenic substances, but even without such external attacks, a DNA molecule is inherently unstable. Thousands of spontaneous changes to a cell's genome occur on a daily basis. Furthermore, defects can also arise when DNA is copied during cell division, a process that occurs several million times every day in the human body, according to the statement. The reason our genetic material does not disintegrate into complete chemical chaos is that a host of molecular systems continuously monitor and repair DNA. The Nobel Committee said the winners' work "has provided fundamental knowledge of how a living cell functions and is, for instance, used for the development of new cancer treatments." But back in the early 1970s, scientists believed that DNA was an extremely stable molecule, Lindahl demonstrated that DNA decays at a rate that ought to have made the development of life on Earth impossible. This insight led him to discover a molecular machinery, which constantly counteracts the collapse of our DNA, according to the statement. Sancar has mapped nucleotide excision repair, the mechanism that cells use to repair UV damage to DNA. People born with defects in this repair system will develop skin cancer if they are exposed to sunlight. The cell also utilises nucleotide excision repair to correct defects caused by mutagenic substances, among other things, according to the statement. 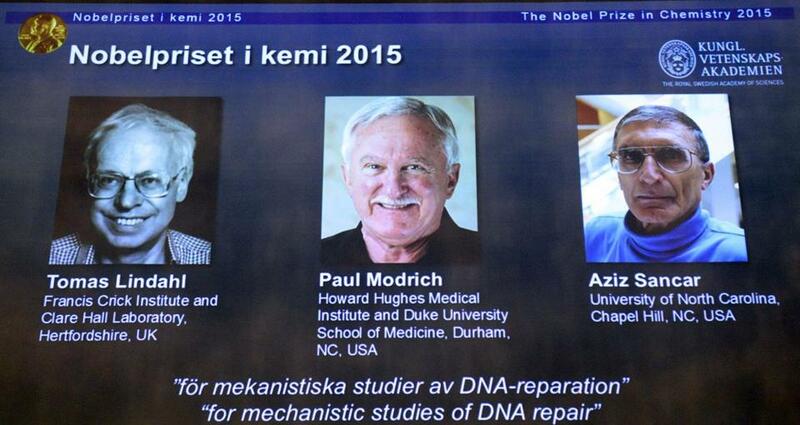 Modrich has demonstrated how the cell corrects errors that occur when DNA is replicated during cell division. This mechanism, mismatch repair, reduces the error frequency during DNA replication by about a thousandfold, according to the statement. The Nobel Committee said that "their work has provided fundamental knowledge of how a living cell functions and is, for instance, used for the development of new cancer treatments." 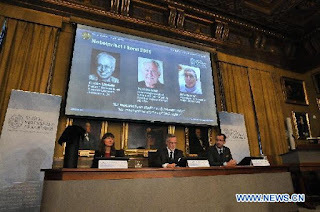 This year's prize is 8 million SEK (about 0.96 million U.S. dollars), which will be shared equally among the laureates.